""Thank you! Thank You! I just love all the information on your site!"" ""Thank you so much for all your help and advice and solving the problem""
""Il y a beaucoup de choses intéressantes dans Studio Backlot et c'est très agréable de les découvrir en Français. Je vais mieux profiter des mines de renseignements qu'il contient."" ""As I was shutting down last night I saw the SB icon on my desktop and this morning I signed in and just did your first basic tutorials. I can't believe how simple you made it for me! Thank you!"" "Ayant travaillé dans le commerce de détail pendant 35 ans, je confirme que le service apporté par Studio Backlot est exceptionnel ! Je n’hésiterais pas à le recommander à mes amis." "Thank you very much for your fast answer and the info. Now everything is fine. Once more many thanks for your great help. It was a real pleasure to receive all your assistance." "Thank you for your generosity in sharing knowledge and the help you bring me in my new learning. Studio Backlot is essential to me. The content and the formations are very good." "This is one amazing site. It explains everything clearly and concisely - No waffle. I've also learnt so much by watching how the experts use the many features. Love it!" "StudioBacklot.tv is constantly inspiring me to use new techniques. I'm so glad I'm a member!" "You've dona a great job explaining various segments of producing a video. At 80 I'm still a novice and creating family videos but you make it so much easier to understand. Thank you!" "My gratitude and thanks to you & staff of StudioBacklot for the excellent service, worthwhile tips & lectures." "Thank you Paul. Your instructional videos have been priceless to me over the years. Keep up the great work!!" ""Gosh, it's been a very long time since I had experienced this kind or customer service or caring,..absolutely thrilled""
""Finally, a great customer support experience. I have been in the business for over 20 years and have never had service like you have just afforded me. I am now a genuine LOYAL customer!"" "Backlot is a must-have if you really want to know your program well, to produce professional results. I highly recommend memberships to anyone thinking about. One of the best investments I have ever made." "Thanks Paul. You are a true professional." "Thanks Paul, You don't mess around!! Also just want to say how much I love Studio Backlot. I drop everything to watch your updates. Keep them coming!!" "Your training products are great. And, your customer service is TERRIFIC! Backlot responded to my questions promptly. Concern for the help I needed was expressed by your responses, not just in words…but the feeling came through, too." "I would like to mention that of all training resources available on the internet, or elsewhere, YOUR programs are, by far, the BEST. Please keep up the excellent work." "This was indeed helpfull- now I mannaged to make a perfect 4K project! Thank you so much!" "I wanted to say I have used Pinnacle Studio products for several years and your training videos have been very helpful to me. Thanks!!" "I'm a subscriber who truly enjoys your site. I have done some incredible commercial related stuff with the help of your training and the amazing add-on content you provide in your "Stock" collection." "You and your website have proven to be invaluable to me. I have learned a ton. You really know how to unleash the power of this software. Thanks again for taking the time to help me." "I would like to compliment your team on the excellent job of making the possibly difficult job of video editing more simple, interesting, and entertaining!" "I sent the first video to my son. I was so proud when he emailed me back and said "If I could give you an award for this video I would". I want you to feel good also because with out all your hard work Teaching us how to use Pinnacle." "Thanks for the quick response. I have already subscribed to your services and your videos are excellent. 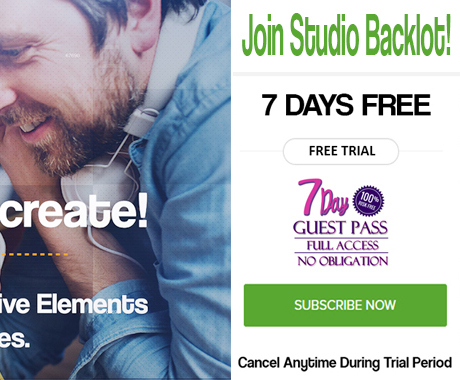 In fact, it would be futile to buy Pinnacle Studio without your videos." "I absolutely enjoy the passion behind Studio backlot and now you have just thrown in some amazing customer service - blended it altogether to make the whole exercise one epic moment in time-Wow guys that is Awesome. Wow³ X WOW³ = Customer Service"
"I love everything about your site and love how much energy and focus you have on teaching people. I try and pass on your website to anyone I talk to that shares my passion for videography"
"I bought online Pinnacle Studio 19 a couple of days ago, and while I am a real neophyte on the matter, the guidance you provide in the videos is astonishing and really helpful. Thank you so much." "Studio Backlot has taught me a wealth of effects and methods to make my movies pop! I especially like the eagerness that Paul Holtz presents in helping us members. Keep up the great work and thanks so much!" "A guy can learn more on your site in a few days than he can in many years or maybe even a lifetime! I know. I'm doing it." "Of all the videos I’ve reviewed on the web, YOU are the best out there! Thanks for all you do for the industry." "I produced a video for the Clinton County Firefighters association this past winter and used some of your training classes in the video. I used the fire in text for the beginning of the video. The video was a hit!" "Your training videos are excellent and I would have been completely lost without them. I am only just now discovering the Stock Content and it is great to be able to supplement my own libraries"
"Thanks for your help with understanding mp3 conversion. 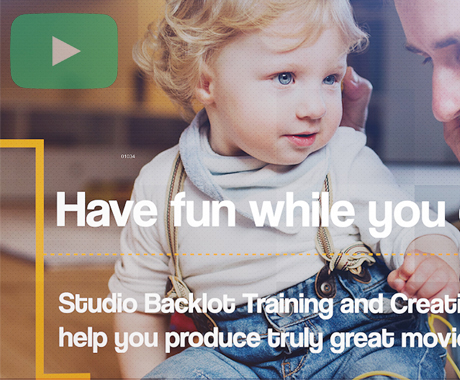 I am within a whisker of creating professional video projects thanks to Backlot. Thanks again for your help"
"I find your ‘site’ amazing in it’s coverage of the pertinent subjects and without it I would have struggled at the first fence. It’s useful for the constant updates of the various suites"
"Luv your tutorials...constantly learning the video stuff. Feel like you’re my next door neighbour coming over and giving me all the latest and greatest hot tips. Keep ‘em coming...!!!" "Utterly Fantastic Site and the Deal of the Decade"
"I immensely enjoy your training videos. You can either waste time trying to teach yourself or you can do the smart thing and learn from the masters." "MANY, many thanks, for your invaluable help, patience, explanations & expositions""
"Thanks for your outstanding instructional videos. There is a gold nugget in each one." "I would like to say THANKS for the dynamic slow-mo tutorial and the multi-cam tutorial. NICE!" "YES, YES, YES! It works! Thank you so much! I cannot tell you how happy I am with Studio Backlot"